I was going to merely add a comment to Terry’s earlier message, but I decided instead to write a more detailed response. Terry still feels that people are biased against post-processed fractals. Well, Terry is entitled to his opinion, and this is a blog, a venue for airing opinions, so now I’m going to air mine. Who cares what Ken Keller thinks? I mean, okay, he’s got his definition of fractal art. It’s his opinion. But look at the date on the referenced piece: December 2003. Hmmm. I think this is old news. Ken references Charles Vassallo’s “Mandelbrot fractals and pretty girls” page; although there’s no date on that page specifically, the text suggests it’s from 1998. Even older news. And Terry trots out some suggestions from the 1999 Fractal Art Contest. 1999. Come on, Terry. 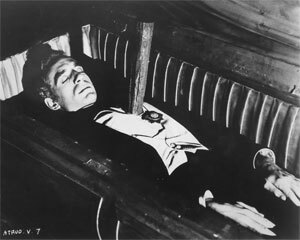 Quit pulling the corpse out of the ground. Let it rest in peace. What you’re seeing is not bias against post-processing. You’re seeing the difference between a technical and practical definition of fractal art. So let me back up for a second, and talk about fractal art and digital art and where post-processing fits in with all of that. Terry is completely on the mark that all fractal images are “post-processed” in some fashion. We color them, or we layer them. Even if we choose “not” to color them, we are in fact making a choice (for black and white) because those reflect a property of the mathematics. Everything we do in creating fractal imagery is interpretation, a visualization of massive amounts of numbers, distilled into a form that we can make sense of quickly. So to say some algorithms for doing this are acceptable while others are not is rather pointless. 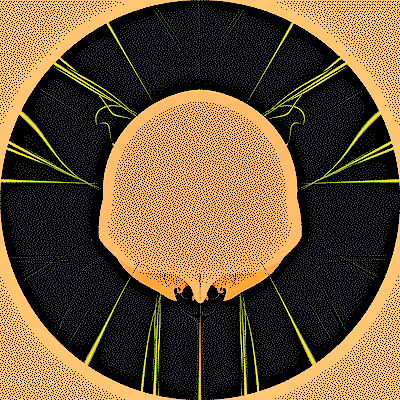 To even suggest that some software can be used while other software cannot is also pointless; I can code almost anything in Ultra Fractal, so the choice not to use Photoshop is really just a personal preference and not one dictated by the art. I have my reasons for the preference, but they have little to do with artistic choices. So really, who gets to decide what is and is not fractal art? Ken Keller’s got his definition. Kerry Mitchell has his. We will each have our own definition, and there's no guarantee that they will be similar. 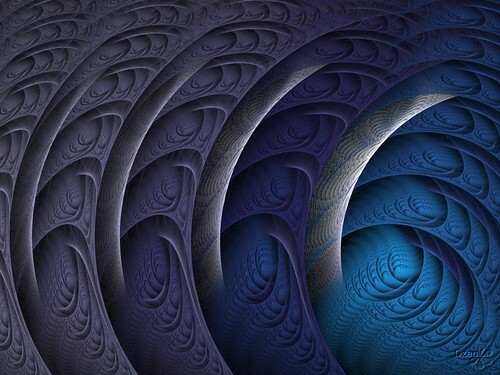 We can likely agree that fractal art is included within the larger category of digital art. After all, fractal art would not exist in its current form without the aid of computers to do the tedious mathematical grunt work. And since the product is a digital image, this makes sense. But what is the difference between fractal art (specific) and digital art (general)? 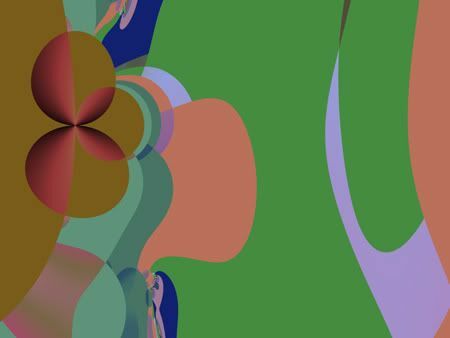 What makes a piece of art fractal? To answer this question I will consider another, easily-recognizable type of digital art: 3D art. 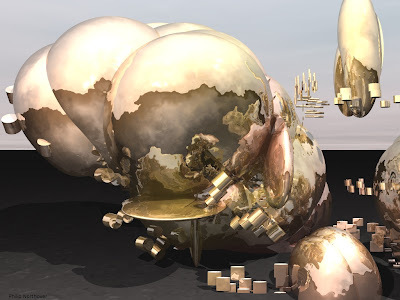 3D art (for lack of a better label) is easily found on sites like Renderosity or 3D Commune. But there’s no rigid definition for it. There are no specific software packages that are required, even though POV-Ray, Poser, Bryce, Terragen, and so forth are popular choices. There is no specific subject matter that is required, although landscapes, spaceships, and… umm… fantasy women seem to be popular themes. You might even try for a more formal definition: 3D art is art where mathematical models of objects and light are used to simulate what an eye might see, with varying levels of realism… but if you used such a definition, you are judging based on the precise details of how an image is created, and that is information you may not have. 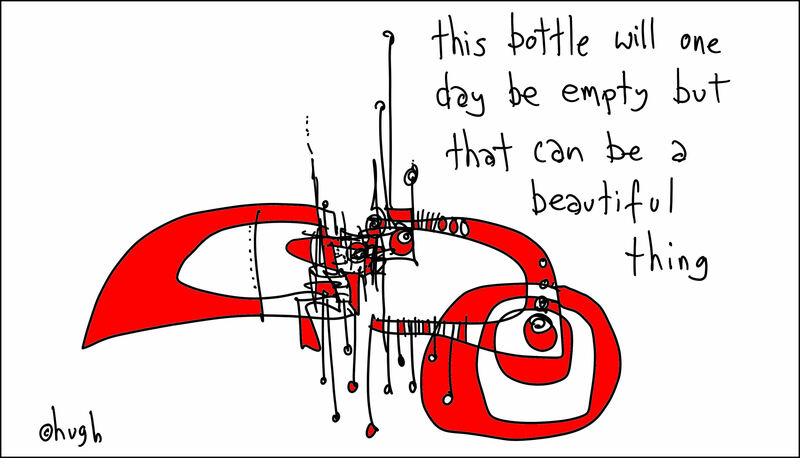 If you do have it, it may be only because the artist gave it to you. But this is like having to ask whether a particular painting is oil or acrylic or watercolor. Does it matter? Is Bert Monroy a photographer or a painter? He’s a painter, but if you only saw his work, without any explanation, I think I’d forgive you for assuming he was a photographer. Similarly, if you saw Terry’s work without description, I think I’d forgive you for assuming he’s a digital artist (general) rather than a fractal artist (specific) because a lot of what he creates doesn't seem to have the same characteristics as a lot of other fractal art. That’s not right or wrong, that’s Terry’s style. If Terry hadn’t told you he’s a fractal artist, you might not know. And you probably wouldn’t care. What matters is whether you like his art, or not. Of course, just because an image is fractal art does not mean it has a high fractal content. And this has little to do with the visualization algorithms selected, and far more to do with the aesthetic judgments of the artist. 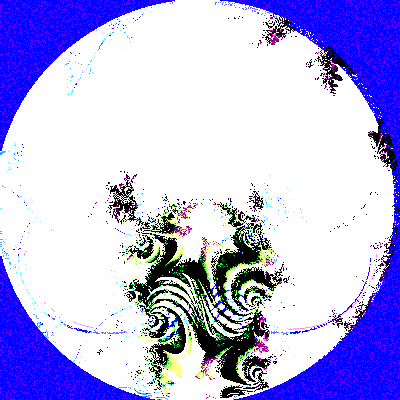 I have created images with very little fractal content. Are they fractal art? Sure! 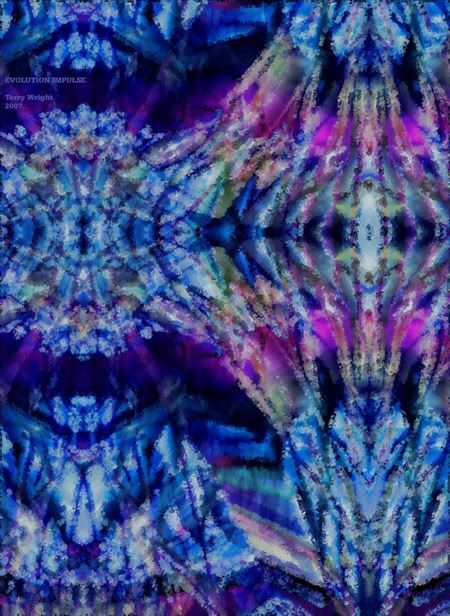 Would anyone familiar with “fractal art” recognize them as such? Probably not! Most of the time, this is an unimportant difference. But some of the cases Terry cites—contests being a prime example—would cause arguably fractal art to be rejected. I can’t speak for anyone else’s contest, since I don’t run them, but I can address the 1999 text Terry quoted and the 2006 and 2007 contests. 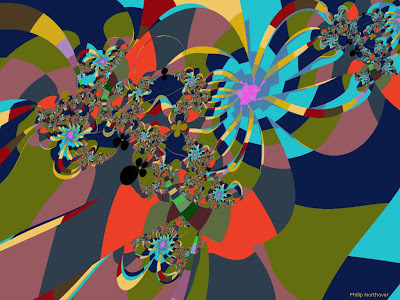 For 1999, voting was open to the public; the suggestion was just that—a suggestion—that images not obviously fractal might not appeal to those primarily interested in a fractal art contest. Similarly in 2006 and 2007, we are selecting artwork for a fractal art exhibition. Artwork that appears less fractal is at a bit of a disadvantage, because we are specifically trying to show artwork with more obvious fractal characteristics. Disadvantage does not mean impossible, however, and for 2006 we in fact selected a barely-fractal image. Iñigo produced this image with popcorn-like formulas, so from a technical standpoint it definitely belongs, but visually it lacks the fractal characteristics of the other winning selections. So while technically, artwork may be fractal in nature, practically speaking others might not label it as such if you don’t tell them. It’s all about knowing the audience you’re marketing your work to. If your customer is looking for a washing machine, you don’t sell them oranges. You don’t even sell them a microwave. You sell them a washing machine. Any “community” site has an audience they are trying to attract. A calendar publisher has an audience they’re trying to entice. An exhibition organizer has a goal in mind for their exhibition. If those goals do not include technically-fractal-but-not-visually-fractal imagery, it’s not necessarily because they hate post-processing (because that’s a distinction that is meaningless). It’s far more likely that it’s because they’re using a visual, practical definition of fractal art. Some of you may assume that I’m picking on Terry here. I’m not; I recognize that every artist has to have their own style. I’m just trying to show that there’s a practical side to this that explains the perceived “bias.” It’s 2007, not 1999. 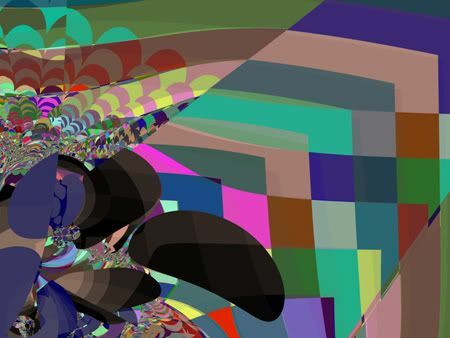 Fractal art is still undergoing rapid change. By 2015 we will laugh at how crude and unsophisticated our images from today are. It’s hard for me to look at my old artwork and not cringe at how raw it is. But all of these voices saying “you must do this or that…” ignore them. Follow your own muse. 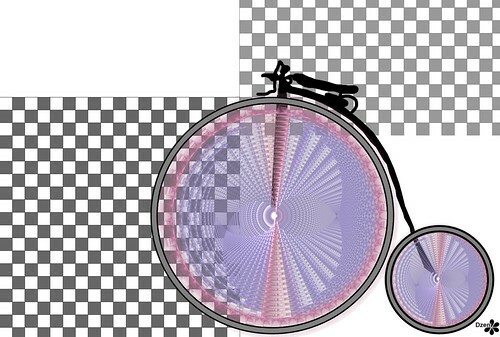 The fractal wheels were made using apophysis. The bike and background were done using PSP. Like this image? Feel free to visit my blog Not Quite Perfect and see what else I've been up to. ...except we don't. The old biases just keep cropping up. I consider the definition of Fractal Art to mean images that are originally produced with a computer program that is dedicated to fractal image generation. It is also assumed that minimal post processing is applied to the final, presented image. 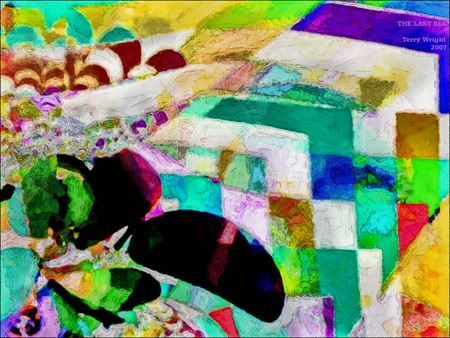 Layered fractal images are categorized as Fractal Art, but not images that are collage type images using other than fractal image elements (such as 'put a pretty girl in front of a fractal' ). Layered fractals are produced by many fractal generation programs and each layer is indeed a genuine fractal. Keller might "assume" such limitations, but I refuse them. It's big of him to give a program like Ultra Fractal a thumbs up allowing hundreds of collaged layers the benefit of still being minimally post-processed. Each layer, he claims, is still a fractal -- even if the final composite is smushed together like hash and stacked like mashed-up pancakes. Anything goes, apparently, as long as the manipulation properly occurs inside the fractal software. 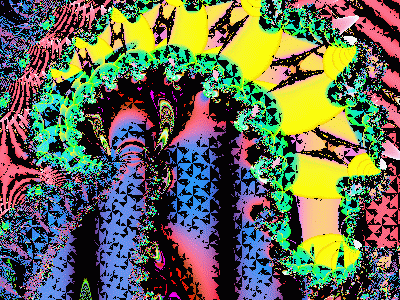 Export your fractal out -- and, well, you're out -- or out of control. Moreover, it doesn't matter how much filtering firepower is built directly into one's fractal software. 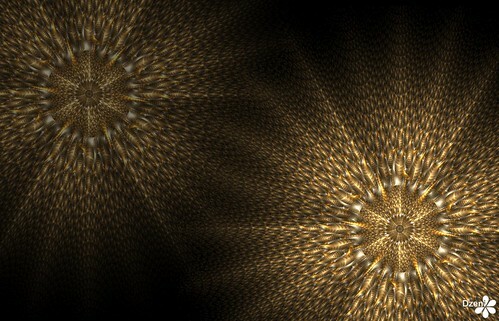 Ultra Fractal can do animations. XenoDream can do lighting effects similar to software by Flaming Pear. 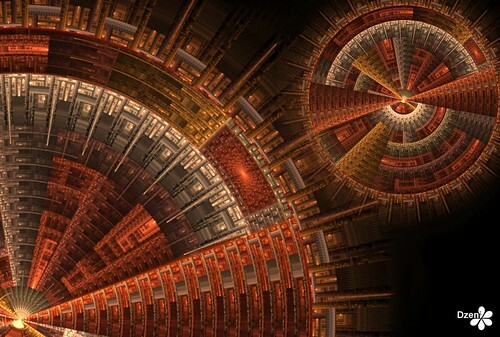 Filters come standard in both Fractal Explorer and Fractal Forge. Do each of these onboard adjustments still use only "fractal image elements"? It is my opinion that fractal pp will remain fractal art, as long as the pp has not ruined the original fractal patterns. Chasm has described it in a most beautiful and clear way: "I was pleased insofar that I've managed to preserve the original fractal contour and much of the coloring, and not ruin the image in a filter-frenzy." Trotsky and Chasm are much more radical than Keller. They actually believe the fractal artist can wander outside of the (ahem) parameters of the fractal-generating software. But don't stray too far from home. That way a filter-frenzied madness lies -- even if Photoshop filters do run by using algorithms. 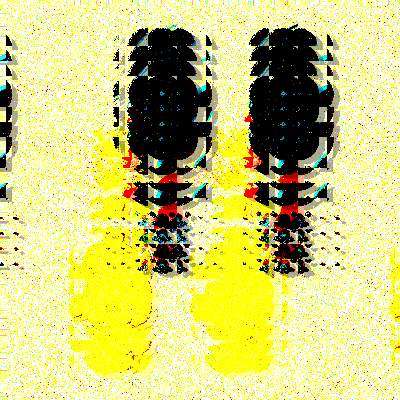 Trotsky calls extensive post-processing "fractal abuse" and "fractal vandalism." Only if the forms are preserved can the art remain "fractal" rather than catch-all "digital" -- obviously an inferior iteration allowing infestations like "black smears" to cloud otherwise serious art. And, whatever else you do, don't ever alter the original fractal forms. They are sacrosanct. 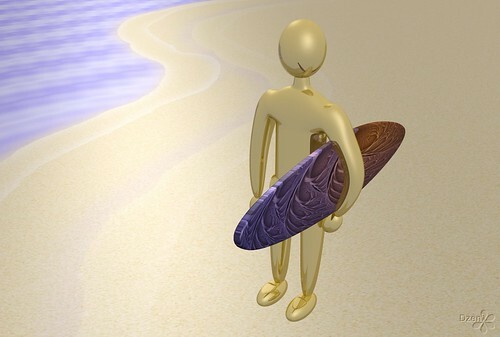 Go too far, and you've crossed an artistic line drawn in the sand by those who've been touched by God (or math -- a lower case god) to be gifted enough to discern such fine distinctions. One of the limitations fractal artists accept is that the medium -- visual representations of mathematical formulas -- imposes some restrictions on the creative process. Producing beautiful images despite the restriction is part of the challenge and beauty of fractals. If you choose to process your image, that is OK as far as the rules are concerned. But you should keep in mind that the more obviously you alter the image, the less pleasing it is likely to be to some of those who vote. The key word you should remember is enhance. We're not really interested in who can apply the most complex filter combinations in Photoshop to produce something barely recognizable as a fractal. We're interested in great fractal pictures. One wonders, given the image manipulation features now pre-built into programs like UF and XenoDream, if the pictures produced today would have seemed "barely recognizable as a fractal" back then. So, what's my problem with all of the above? For one, I don't like limitations on making art -- especially when the restrictions seem designed to benefit some fractal artists while punishing others. For another, if everything above represents the current fractal art canon -- and I believe it probably does -- then I've been permanently banished outside the castle walls. Making a fractal is not the same as making art. Anyone can make a fractal. In fact, anyone can make about twenty in less than a minute using a program like Fractal ViZion. Does that make one an insta-artist? No. I can stand in my backyard with a digital camera, spin in circles, and snap the shutter randomly. I may be taking pictures. I am not, however, making art. Fractal art is not exempt from the longstanding characteristics that define visual art: composition, depth, perspective, texture, and so on. I hate to be the bearer of bad news but that quickie render you just slapped up on Renderosity might not really be a masterpiece. Fractals have to be made with more than math and craft to become art. If not, they are just fractals -- just empty snapshots of the backyard. Furthermore, every fractal artist post-processes. No exceptions. If you've changed your fractal from its initial iteration and removed it from the generator, you've altered it. Use image compression? Unsharp mask that sucker? 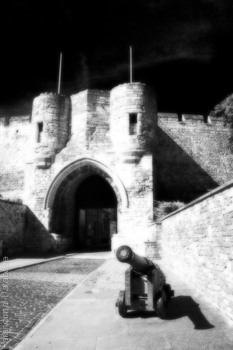 Add a signature or frame or watermark? Upload that baby to the web to float in HTML? You're guilty of post-processing. We say a fractal image has been post-processed when it has been imported into a graphics editor to adjust any of its original properties. That results in a modification of the master picture as it came out of the fractal generating software alone. 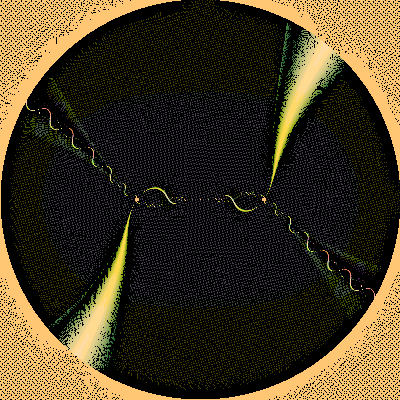 This is a normal practice in digital graphics creation, but still divides the group of fractal artists in two camps: those who prefer to leave the fractal as is (keeping its natural form) and those that routinely enhance its appearance with the intent of improving or increasing the artistic output. Ultra Fractal helped to change that perception because most fractal artists are using it almost exclusively, unleashing its power to combine several layers into a single image. Since all adjustments are done inside the same application, some people think they're not post-processing the picture, but the truth is that all those operations are altering the base image, equaling what will normally be post-processing. So, the only questions about post-processing then are how and how much. Apparently, if you believe the poobahs, using your fractal generator, no matter how extensive its built-in manipulation functions, is cool. You are still and always will be a legit fractal artist. But export your fractal to another graphics program and begin flailing away, well, you've somehow cheated. Or, worse, you're ignorant. You failed to read the rule book and follow the universally understood (even if arbritary) limitations. And how convenient is it that the most expensive fractal software also has the most post-processing capabilities? 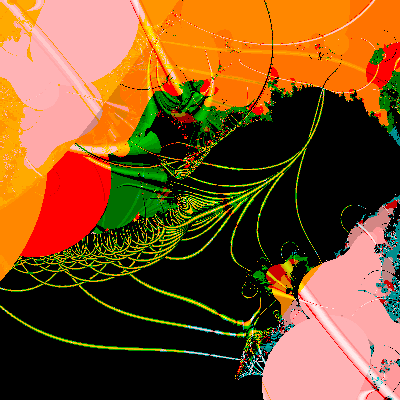 No wonder I used to see something like this tagged to posted images at on-line fractal communities: Made with UF. 100 layers. No post-processing. Who are you kidding? You bludgeoned that thing within an inch of its pixels! But you've manipulated nothing because you've miraculously remained within the (self-imposed) limitations and kept your extensive collaging activities strictly inside UF? I bet I could export each of those layers into Paint Shop Pro, mush them together, and come up with something wildly close to what you did. The limits thing? I understand that, I guess -- up to a point. 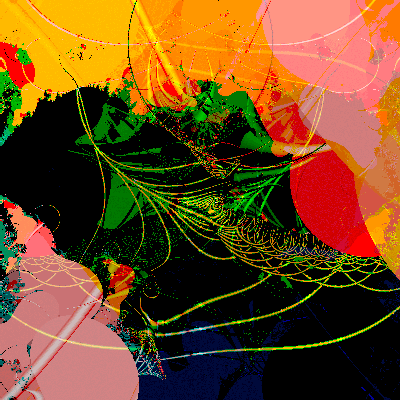 On my web site, I describe my own work as "fractal-based digital art." But, frankly, I think that's what UF makes, too. I'm wondering if these fine distinctions matter less to me than they do to others. 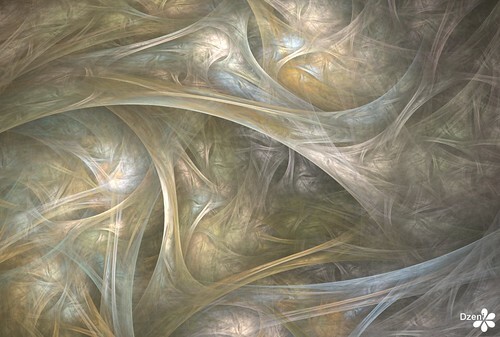 I'm more interested in breaking out the art part of fractal art -- not making bonds tighter. I'll blow up the fractal forms if I like the effect. 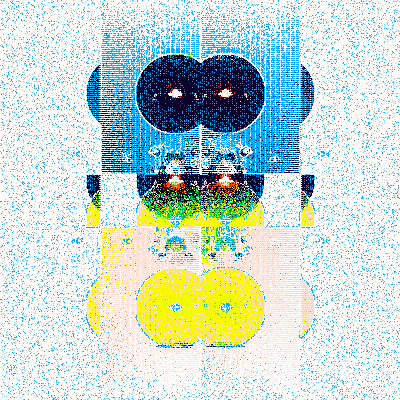 I'll post-process a fractal to the point where code words like frenzy don't begin to cut it. I'll do whatever it takes to drag that fractal lake and dredge the art out of my fractals. In a variation of the Vietnam paradox about saving villages, sometimes I have to destroy the fractal in order to save it. And, however much I atom-smash the stalks and spirals out of my images, when you strip away all the multiple layers and many adjustments, you end up with the original parameter file. Just like that very first fractal made in UF way back when by somebody somewhere before everyone else decided to pile on. Here's a demonstration of my point. I thrashed this one every which way possible -- but the fractal forms are still relatively intact. Did I cheat? Or was I going about trying to make art from what I initially saw as a backyard picture? Did I go too far? Was I merely "revising"? Or just using the colors and textures to highlight the overall arrangement? In short, was I exercising artistic control? Or was I committing the sin of "post-processing"? Here's another case. I warn you though. Don't stray far from the fainting couch. This one probably constitutes "fractal vandalism." Uh-oh. Break out the smelling salts. Somebody colored outside the lines. 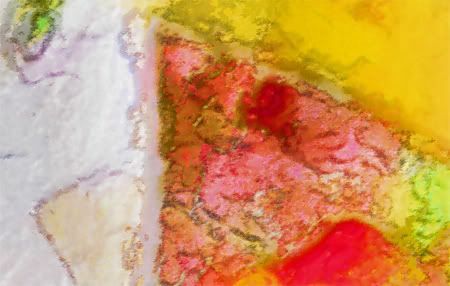 Post processing using an image editing program such as Photoshop, or Paint Shop Pro is allowed as long as the focus of the image is a fractal. Oh yeah. We wouldn't want the focus of an art contest to actually be on the art. This is just a quick reminder that the deadline for entering the Benoit Mandelbrot Fractal Art Contest 2007 is approaching. Please finish your entries by June 30, 2007. For more information, please visit the contest web site. The thing that I love about fractals is that with Artistic control, you can create visual poetry. Whilst the process may start off as a "random flame", with a bit of patience (and luck), it can turn into something quite cool. Fractals (at least to me) can be so much more than machine generated images. A good fractal is alive, it resonates, it speaks to one's soul. In a nutshell, it doesn't do what Inkblot Kaos, Sterlingware, Tierazon or Xaos does. 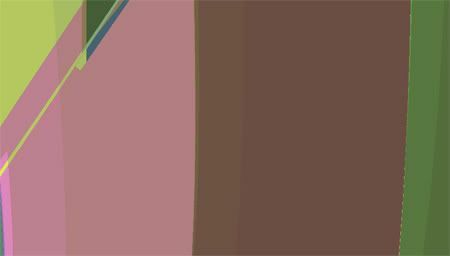 I want something that sprouts artwork after a couple of clicks. Ultra Fractal? It's just too much work. Too many layers. Too many moving parts. Too many moving parts that I have to move. My first attempt at Ultra Fractal was three or so years ago. I don't remember what version. I didn't seem suited to it, but I didn't think much about it at the time because I had plenty of other new fractal programs to work with. I didn't know much about fractals in general, so I discounted my doubts about Ultra Fractal figuring I just didn't understand it. I picked it up again a year later because I had seen some really awesome artwork made by Paul DeCelle. 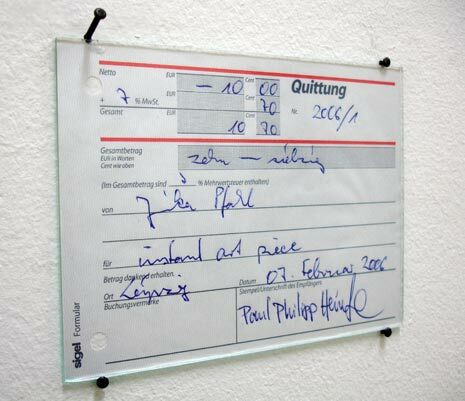 I looked at Paul's work and thought, "I want the machine that made that and I don't care if I have to pay for it". 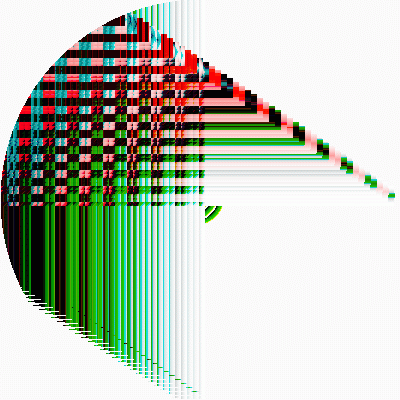 Well I downloaded some UF parameter files by Samuel Monnier (thanks, Sam) in hopes of getting some insight into the secrets of making these intriguing images. I have never seen anything take so long to render. It had something like 18 layers or parts to it. Yes, some of you may be thinking, "Only 18?". Well, I got Paul's machine all right. What I didn't realize at the time, but I have now come to understand, is the machine doesn't make the artwork, the artist uses UF as a tool to make the artwork with. The program doesn't come with an artist. You see, that's the whole problem. 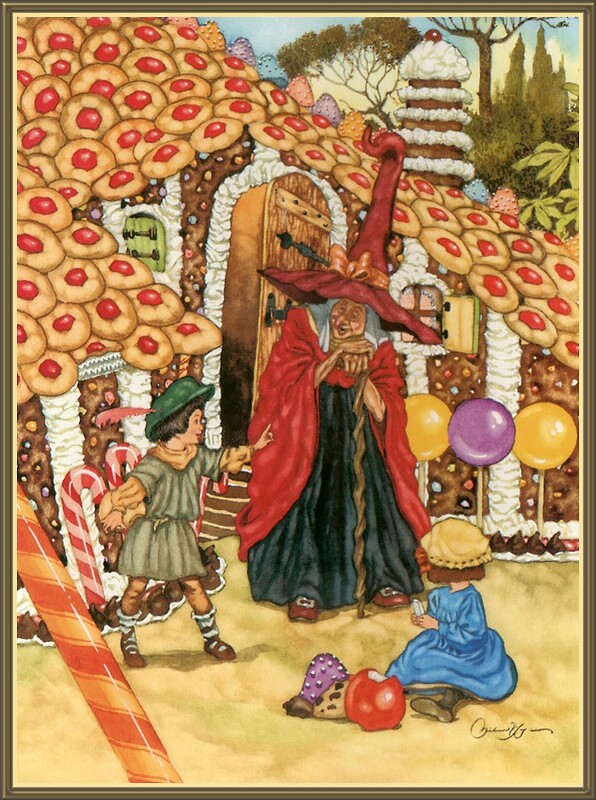 There's no digital Rumplestiltskin inside UF like there is in most other fractal programs. Stop me if I'm wrong, but UF is all about layers, and layers are chosen and positioned by a human mind and not a computer algorithm, although an algorithm may have made each layer, separately. This may explain why there is very little really "freaky" stuff made in UF: there's too much artistic control. Even Gertrude Stein agrees with me. Here's what she had to say about UF; "Freaky is not as strange as we can imagine. Freaky is stranger than we can imagine." This image shows one technique I've been working on lately--rendering photographs by using a wavy, dreamy pattern (my Caramel Popcorn and Crosshatch formulas) to represent brightness levels of red, green, and blue. 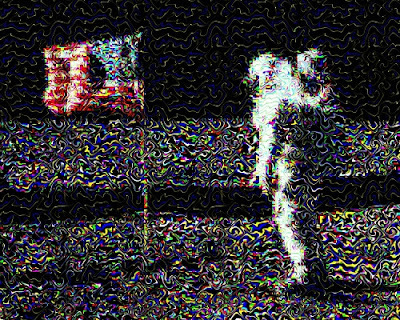 The subject photograph here is a NASA shot from Apollo 11, of Buzz Aldrin and the American Flag. He and Neil Armstrong landed on the moon when I was 8--it was my dream for all of my youth to be an astronaut. The above graphic is also available as wide screen wallpaper. Just click on the images to get to their flickr pages and download the largest version if you want to. Perhaps at one time a rain dance seemed to make the rain come and became part of the ritual thereafter. One of my psychology classes mentioned an interesting lab accident. An automatic food dispenser broke and started giving food pellets intermittently. The pidgeons weren't to know this and when the psychologist next took a look, he was surprised to see the birds running in circles, making beak taps, hopping up and down, and other curious things, then rushing to the dispenser. They'd repeat if a pellet appeared, otherwise they'd redo their ritual, adding refinements if it seemed to result in a pellet. The psychologist dubbed it superstitious behaviour. These were screwed up birds by the end of it. 3D meets fractal can be fun. Not related to my pic, which shouldn't be too hard to figure out, but The Moneychangers is an old Arthur Hailey book. Rather heavy going compared to Airport. Some speculate that Airport inspired D.B. Cooper. I'd just about convinced myself that D.B. didn't make it when I ran into a parachutist on an online forum, who was of the opinion that D.B. triumphed. There are strange things done in the midnight sun by the men who moil for gold. Did the ends justify the means? Did you get your rain? Your gold?